Join us for a wet, sandy, adventurous, fun-filled week! Check out 2016 camps at ptmsc.org/camps. To register your child for a PTMSC Summer Camp, please click on one of the camps below. You will be directed to the online registration form. Fill out this form once for each child per camp. Payment in full is requested upon completion of the online registration form. PTMSC members receive $10 off each registration. If you are not yet a member, we invite you to join today to enjoy this and many other members-only benefits! Explore and learn about the beach and sea creatures. Activities will enhance the natural curiosity and vivid imagination of this age group. Campers will spend time outdoors and at the touch tanks with trained and attentive counselors. Spend a week exploring and discovering marine and coastal life, animals, plants, and secret spots. This half-day camp is all about fun, with activities in and around the Marine Science Center. It’s a great program for the younger camper who loves marine animals and exploring on the coast. Ready, set, explore! Examine the varied coastal environments of beach, glacial bluff, forest, pond, and meadow. This is the perfect camp for nature-loving kids who want to explore it all! Using observation skills, campers discover how these places support life in the coastal ecosystem. Immerse yourself in Marine Biology! Campers engage in exciting classes, labs, and field programs. A few of the many captivating activities include: sieving through goopy sediments looking for brittle stars, pulling a seine net through eelgrass beds to learn where young fish hide and using microscopes to observe the plankton that supports all life in the sea. Calling all budding Marine Biologists! This camp takes marine biology skills to the next level through hands-on activities. Students sail aboard Northwest Maritime Center vessels while doing scientific investigations. Ashore, students participate in intertidal surveys and labs in the touch tanks and exhibits. Campers work together as a team while learning to be stewards of the marine environment. 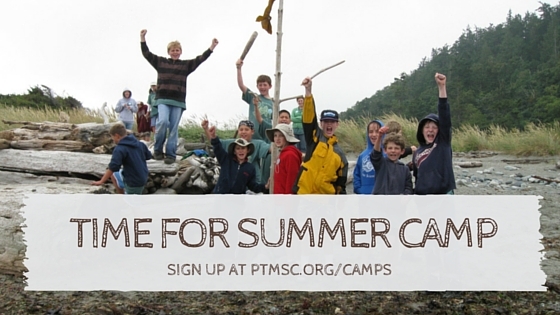 If you have questions about any aspect of camp, please email us at camps@ptmsc.org or call us at 360-385-5582 ext 104. In the event that you can’t make it to camp, PTMSC is happy to refund 75% of the full cost of camp retaining a 25% cancelation fee provided the cancelation request is made at least 30 days prior to the start of camp. After that date, no refunds are made.